Human Rights Activists News Agency (HRANA) – Over the last few days, three distinct protests were organized to express the yet-unmet demands of three separate collectives: the Citizens of Zabul, the residents of Bibayani village (of the Dasht-e Zahab tributary of Sar-e Pol Zahab), and a number of shareholders of the bankrupt Caspian Institution in Tehran. HRANA reported today that Caspian Institution shareholders were gathering in front of Tehran’s Majlis building. The group, who started staging protests two years ago, includes a mix of investors and shareholders from financial and credit institutions. When their public demonstrations first began, the government and Central Bank of the Islamic Republic of Iran (CBI) committed to paying the dividends owed to investors. According to the CBI, over 95% of reclamations against the Caspian Institution have been resolved. 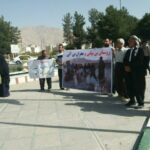 HRANA reported today on a group of Bibayani village residents who were gathering before the Kermanshah Provincial Governor’s office. Sar Pol-i Zahab is a town bordering the province of Kermanshah. According to a September 2nd report from Radio Zamaneh, a group of Zabul residents (in the province of Sistan and Baluchestan), in protest to financial corruption and abysmal public services in their municipality, used mud to seal shut the entrance to the municipality building on Saturday, September 1, 2018. Some time ago, judicial officials reported on the arrest of 11 city council members and municipal employees on charges of financial corruption and embezzlement. News agencies affiliated with the government reported that these protestors were decrying pollution and lack of public services. Images published on social media tell a different story: shared photos feature protesters brandishing signage reading “When embezzlement is ousted, Zabul will be a paradise”.